A stirring, powerful ballad that alternates improvisation with composed melodies. Lead sheets, second parts, C condensed score, and Kenny Drew's original piano manuscript available. October 2013: Kenny Drew, Jr. performing his father's composition during a master class in Brooklyn Center, MN. Full of both nostalgia and pathos, Dark Beauty is deeply emotional and haunting. The ballad is formed of alternating composed and improvised sections—we've notated the beautiful improvisations Kenny plays, except for the sixteen bars of open solo in the middle of the form. The combination of intricate improvisation and simple, lyrical composed melodies yields a complexity that makes Dark Beauty such a powerful ballad in this trio performance. Another way to approach this composition in a trio or quartet context would be to play from the lead sheets found with the "For Sure!" album as your starting point. We've also made Kenny's original piano manuscript edition available (labeled Solo Piano Arrangement), so you can see how he wrote out these marvelous B sections, giving you yet another way to approach them. With this edition, Kenny has actually also created his own Solo Piano Arrangement. Both of our trio and quintet audio excerpts start with the melody. To set the atmosphere for the melody, Kenny adds an introduction of four arpeggiated fermata piano chords, which is also the way each recorded arrangement ends. Kenny Drew composed and first recorded this piece in Copenhagen on his trio recording "If You Could See Me Now," later released on CD as "Dark Beauty." Drew was one of the important American musicians to move to Europe—first to Paris in 1961, and then to Copenhagen in 1964 where he lived for the rest of his life. He quickly became a major figure in the Copenhagen jazz scene, especially through his collaboration with Danish bassist Niels-Henning Ørsted Pedersen, heard also on this trio recording, along with the youngest Heath brother, drummer Albert "Tootie" Heath. When "Tootie" was in Europe, you'd find this trio together. Check out the Dexter Gordon video of Soy Califa: it's a great example. 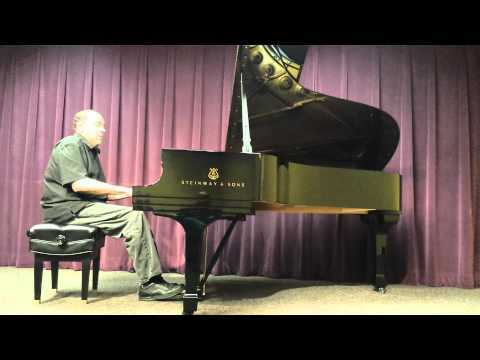 Solo Piano Arrangement: A piano solo drawn from Kenny Drew's manuscript. Piano Melody Transcription: This is the way Kenny Drew interpreted his melody, which alternates with improvised sections, on the "Dark Beauty" album. Recording: Kenny Drew - For Sure! Here, Kenny Drew's powerful ballad is performed in a quintet context. Both this quintet version and the trio audio excerpts start with the melody. To set the atmosphere for the melody on the complete recordings, Kenny added an introduction of four arpeggiated fermata piano chords, also the way each recorded arrangement ends. This quintet version has a Condensed Score edition (all counter melodies and hits notated—a valuable resource for rhythm section players). The lead sheet editions also double as first part editions if you have a quintet (see our second part editions). This recording was done in Los Angeles on one of Kenny's visits to the US, four years later than his initial trio recording. This is the only recording we've found with Kenny playing with either Charles McPherson or Sam Noto. Sam was an excellent small group trumpet player who started his recording career with Stan Kenton's Orchestra in 1953. During his tenure with Kenton, Sam recorded two classic Gene Roland compositions, Opus In Chartreuse and Opus In Turquoise available now on "Contemporary Concepts." Check out the "For Sure!" album for more songs and historical information from this session.